For the last 9 months I’ve had been riding the Easton EC90 crankset and ceramic bearing BB. Easton leapt into the crankset market with the EC90 road crank after thoroughly testing the competitors’ offerings. What they came up with was a hollow structure with a spine down the length of the crankarm. The end result is visually bold, or bulky depending on your point of view. I would say that the EC90 crank looks right on a carbon bike, the left crankarm cupping over the external BB (which is fully compatible with Shimano external bearing cranksets), but the Easton crank looks awkward on slimmer metal framesets, even on my oversize-ti Bianchi. Beyond styling, the blockiness of the crank did yield one real annoyance. I would occasionally clip the heel or buckle of my shoes under vigorous riding…hard. One thing I like about the Easton crank is the ease of installation and adjustment. The EC90 crank closely mimics Shimano’s method of fixing the left arm to the crank spindle: two M6 pinch-bolts close a slot at the top of the left arm around a splined 24mm axle. This method is rare for carbon cranks, as carbon isn’t the best material for that kind of concentrated loads. Typically, carbon crank manufactures prefer to have an alloy insert on the crank with a splined and tapered interface; a large diameter fixing bolt pulls the crank onto the spindle to achieve a friction fit. 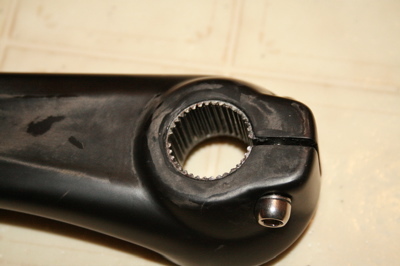 But the Easton bulky left crank arm hides a metal interface to take the load of the pinch bolts. 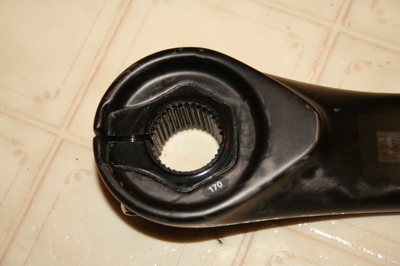 Thus, the cap at the end of the spindle primarily serves to preload the bearings, just like on Shimano cranks. Then Easton makes it easier by machining the cap to adjust with a 5mm allen key rather than Shimano’s spline tool. There is a non-adjusting cap on the driveside of the crank as well; it is permanently fitted into place during manufacturing to backup the epoxy bonding of the spindle to the crank spider. 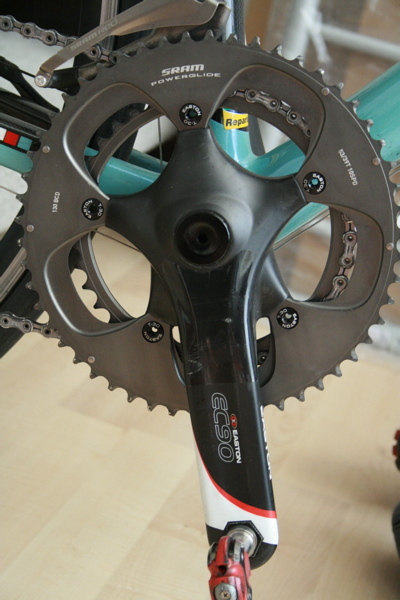 With all the markings and tech acronyms on the chainrings, one is led to assume that they are France’s Stronglight CT2 chainrings, though Easton’s literature makes no mention of a French connection. Regardless, the chainrings seem to work adequately on an otherwise Shimano 7800 drivetrain, but the ceramic and teflon coating hasn’t proven to be especially durable. When I switched the EC90 crank to my SRAM Red bike, I changed out the rings to Red, mainly in the interests of aesthetics. The Easton ceramic bottom bracket is well-machined and precise, installing with the same tool that Shimano has made the de facto standard for external bottom brackets. Perhaps not quite as stunningly smooth out of the box as an FSA ceramic bb, the Easton unit had nevertheless dramatically less drag than a Shimano Dura Ace. After seven months, the Easton soldiers on without any trace of degradation. Regardless of what rings were mounted, the EC90 was rock stiff in sprints, giving away nothing against the Dura Ace standard. 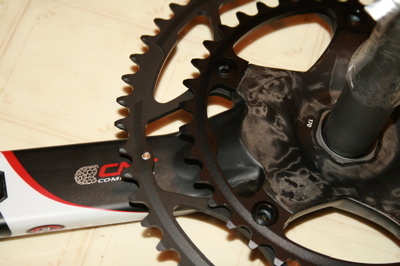 I could go on and on about carbon this and stiff that, but in the end, it’s a crank. It’s a touch lighter than some other premium options, and it’s as stiff or stiffer than any of them. It mounts up easily and has no mechanical quirkiness, nor does it require a proprietary bottom bracket. It transfers power from you on the pedals to a chain on a toothed ring, end of story. As for looks, take it or leave it, but the Easton EC90 gets the job done.